A recent visitor to Japan told me that she had an uneasy feeling visiting Yasukuni shrine as a foreigner. She reported that there were very few Japanese people there, especially considering it was a public holiday, a time when most shrines and temples in Japan are overflowing with temple tourists. “Not only that, it was kind of eerie and sad,” she said. 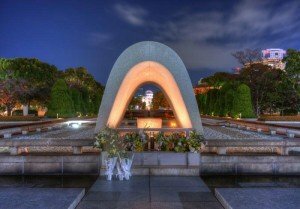 Yasukuni shrine is a controversial site in Japan. Former prime minister Yoichi Koizumi was constantly criticized for praying at the shrine and prime ministers have been judged according to whether they visit this shrine or not. The shrine itself was built in 1869, under orders of the Meiji Emperor, but it did not become controversial until the mid 1980’s. Over 2.4 million soldiers are honored at Yasukuni and their names appear in a special book housed at the shrine. Of those soldiers, 1,068 have been convicted of war crimes, 14 of whom were Class A war criminals. You can look at a visit to Yasukuni in two ways. 1: That if you visit Yasukuni shrine, you are basically showing your respect for war criminals and the Japanese Imperial Army of that time. At the same time, you are showing disrespect to the countries who were victims of the war crimes. Or 2: That Yasukuni is a shrine that was built as a national shrine to commemorate all people (including aid workers and foreigners) who lost their lives during military service to Japan. While Yasukuni was at one time under the control of the state, it is now a privately funded operation which also runs a war history museum on the same grounds. For tourists, there are many festivals and rituals year-round, including a daily “Kagura” event. Despite its apparent right-wing connections, Yasukuni is an important part of Japan’s history, politics and culture. A trip to Yasukuni should bring more awareness to war, its inevitable crimes against humanity, and should be used as another plea for world peace. 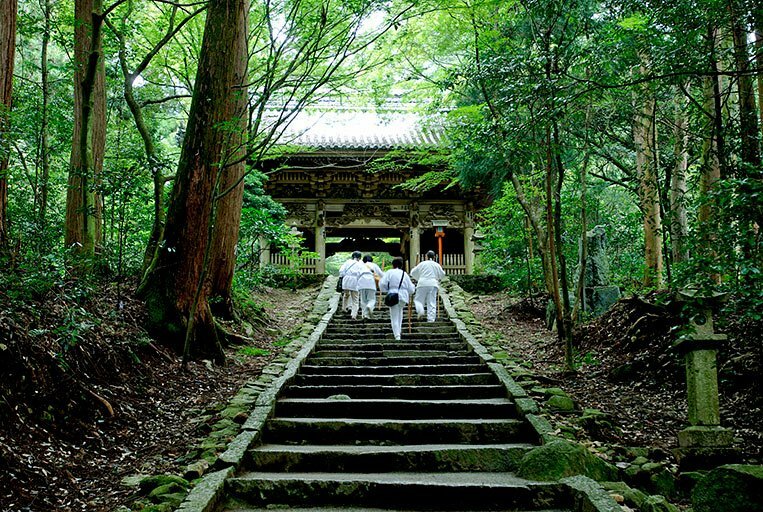 Recently, there has been an increased interest in Japanese people visiting haunted places. Where are these places? Below are some of the creepiest places in Japan. What makes them so scary? Why not go find out for yourself?! Though not really a mountain, this area in Aomori prefecture is the traditional gateway to Hell for Japanese people. It is a volcanic wasteland with many sulpher springs that give the place the smell of rotten eggs. Many people do visit the temple and surroundings here, but only in the summer time as the area is snowy and cold in the winter months. This is a famous place for people to commit suicide and is responsible for nearly 70 deaths per year. The area is dense forest, so not many things grow inside. The place is also popular among sports-minded people who use the grounds for walking, jogging and sightseeing. All you have to do is get off the path, it can be very, very scary and hard to find your way back. This tunnel was dug to connect Kamakura to the city of Kotsu. However, the tunnel was dug underneath a cemetery of “yagura” (graves in the steep hillsides). These graves are said to be the tombs of soldiers. To have the scariest experience, walk through the tunnel at night and climb up the mountain to the graveyard. 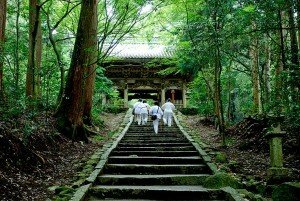 Kamakura is also the site of a mass suicide by over 800 samurai who committed hara-kiri in front of Tosho Temple in 1333. The samurai faced being captured by imperial forces and chose the samurai way: suicide over surrender. Harakiri Yagura is a cave where the remains of the samurai were buried. Not recommended that you visit alone or at night…. If these places sound a little too scary for you, then you might want to try some of Japan’s haunted houses. Toei Uzumasa Eigamura (Kyoto Studio Park) is an entertainment park where you can see filming of Japanese period dramas. Inside the park there is a reputedly very realistic and scary haunted house. Another is Fuji Q Highland Amusement Park’s three-story Haunted Hospital, about and hour and a half outside Tokyo. This was previously a real hospital that was abandoned and afterwards made into an attraction. Some Japanese people believe it is actually haunted. People often ask me when the swimming season is in Japan. This is difficult question because nearly every beach and pool opens at a different time. The swimming season officially starts when the Shinto priest holds Umi Biraki (opening of the sea) ceremony. In this ceremony, the priest purifies the sea and water, making it safe to swim. Where I live, on an island in Western Japan, Umi Biraki is always held on the first Sunday in July, which seems a little late for a public swimming beach, but the crowds start coming only after this. Other beaches open earlier. I have heard of some of the popular Tokyo beaches opening near the end of April and in warm Okinawa, they can open in mid—March. . Most Japanese on Honshu will wait until the official swimming season, even though the weather may be warm enough for swimming before then. July and August are generally considered to be the swimming season months as they coincide with the summer school holidays. This doesn’t mean you cannot swim before Umi Biraki, it just means that you won’t see many Japanese people, if any, swimming so early as they consider it outside of the swimming season. Much of this adherence to a “swimming season” may be due to the fact that in Japan, going to the beach is a special event, much like we would take a picnic in the West. While we tend to take a minimalist approach to going to the beach packing just a hat, sunglasses, a book and a beach towel, the Japanese will take everything plus the kitchen sink: A tent to keep out of the sun, a large vinyl sheet to sit on, some beach chairs for the adults, their own BBQ and a cooler to store food and drinks. Going to the beach tends to be a family or a group event. As a result, most families plan to go to the beach once during the whole summer. Therefore, they’d prefer to go when it is really hot outside and they can appreciate a day of cooling off and lounging by the sea. August 16th marks the rather abrupt end to the swimming season, which is also the last day of the summer “O-bon,” (Festival of the Dead) holiday. The end of the swimming season coincides with the time of year when jelly fish start making their appearance in the waters so it can be dangerous to swim. To discourage children from continuing to swim after O-bon, adults will tell them that there are “kappa” (water nymphs) in the sea that will come up and grab their legs! Check with the local beach, or the locals who live near there, to find out when Umi Biraki is. Public swimming pools also have a swimming season but no special ceremony for opening that I know of. The indoor (but not heated) pool where I live is open from June through August, even if it is warm enough to swim before or after these months. Check with the local swimming pool for their times of operation. Golden week, from the end of April to the beginning of May, is one of the biggest travel times of the year for Japanese people. It’s called Golden Week because several national holidays line up during this period and, together with a weekend on both side, means many people can take the entire week off, if not longer. The dates for 2008 are: April 29 Showa Day, May 3 Constitution Day, May 4 Greenery Day, May 5 Children’s Day, May 6 (Greenery Day observed). If you happen to be traveling in Japan at this time, however, be warned! Trains, planes and busses are crowded and sometimes it is impossible to get seat reservations on any kind of transport. One good thing to remember is that the heaviest travel days are the first day of the holiday, when everyone is leaving on vacation, and the last holiday when everyone is returning home. If you’re trying to book a flight, for example, try one of the in-between days rather than the first day or last day (or two) of the holiday. Following are some of the best online tools for planning your trip to Japan during Golden Week or any other time. Hyperdia Timetable – Want to know exactly what trains to take, at what time, the exact price and the distance in hours and kilometers? This web site has all the plane and train routes around Japan. Just type in your starting point and your destination and let the web site do the rest. Hyperdia is up-to-date and accurate. Make a printout of your search and you’ll have at least 5 possible routes to compare by time, price and convenience. To access the site, go to www.hyperdia.com then click on “English” in the upper left hand corner box. Then type in your starting point and destination. Wallah! Time and date.com – This is one of my favorite sites that is good not just for Japan, but any country in the world. Time and date.com gives you the current time in Japan as well as helpful planning tools such as a calendar showing all of the Japanese holidays. It also has fun tools such as a customizable count-down till your trip date, sun and moon calendars, a meeting planner and calendars for any date in the future. Remember, the key to traveling successfully during Golden Week is to make your reservations for transport and hotels early. Pink is the only color you’re going to see for the next few weeks while it is cherry blossom season in Japan. The good news is that even if you’re not in Japan, you can still do quite a bit of arm-chair cherry blossom viewing. So put your rose-colored glasses on and let’s start some virtual cherry blossom hunting! To start with, you’ll want to join the crowds of Japanese internet surfers following the blossoms as they first open up in Okinawa in March and travel north where they will finally bloom in Hokkaido in May. You can get the cherry blossom report for over 50 locations in Japan, so you can know exactly where the trees are blooming. Once you know that the cherry blossoms are blooming in a certain area, you can do your O-hanami (cherry blossom viewing) online. The following dates were predicted for various cities around Japan: Tokyo, Yokohama and Nagoya: March 26; Hiroshima and Takamatsu: March 29; Osaka: March 30; Fukuoka: March 27; Kagoshima: April 1; Niigata: April 11th. Weathernews Web site (The Sakura Project). Happy Armchair Cherry Blossom Viewing! Go into any convenience store or supermaket in Japan now and you will see displays of devil masks and dried soybeans. Pick up a set (they’re sold together) and get ready for the annual bean throwing ceremony! Held every year on Setsubun (Feb. 3), the last day of winter according to the lunar calendar, bean-throwing ceremonies take place all over Japan in private homes, and also temples and shrines. The ceremony dates back to to the Muromachi Period (1333-1568), and the purpose is to drive evil away for the next year. And exactly how does one drive evil away? Easy! By yelling “Devils out, fortune in!” while throwing beans at symbolic devils, represented by people wearing devil masks (see photo). The very polite and obedient Japanese devils (oni) apparently listen and keep away for the year. There are several famous places to go to see bean throwing events, such as at Sensoji Temple in Akakusa, Tokyo, where 150,000 people attend. If you’re a sumo fan, visit the Setsubun festival at Tomioka Hachimangu shrine, where they also honor sumo wrestlers with their names etched into the “Yokozuna Stone.” Several sumo wrestlers throw beans and rice cakes to crowds of people. If you catch one, you’ll get a whole year of good luck. But if you’re not into crowds and would like to participate, ask around at a small local shrine or temples where it is done more as a tradition than an event. Or, tell a Japanese person you’d like to see the ceremony, and they just might invite you to their house for the real thing! When the festival is performed in the home, the father will dress up in an oni mask, and the family members will throw beans at him while chanting the “Devils out, fortune in!” mantra. What happens to the beans? You eat them afterward–one bean for every year old you are. This will bring you even more good luck. If you can participate in the Setsubun event, I don’t suppose you’ll have to worry about running out of luck this year.